Since it launched in 2008, Jouer has ascended in the beauty world from small presence in New York to major player in makeup bags everywhere. Cult following is an understatement. You can chalk this up to an ingenious concept: customized, portable palettes, and a founder who practically defines the word chic. Christina Zilber, the daughter of a fashion model, grew up learning that makeup should always be classic and effortless and never overpowering. This mantra led her to develop Jouer, a “no makeup artist” required line of makeup designed to complement individual fashion sense and lifestyle. Christina chatted with 312 Beauty, sharing her secrets to flawless skin, what’s in her perfect Jouer palette and a little tease at what she’s working on next! Take note of four key words: more Sparkle and Pop! As far as aging in reverse goes, you’re writing the book. What are your skin care secrets? Well, thank you for THAT! I’m a believer in keeping skincare simple but effective. I wash my face every morning and night. I use a Vitamin C serum in the morning and an over the counter Retin A serum in the evening. That’s it! Vitamin C is a strong antioxidant which fights free radicals, evens skin tone and makes your skin bright and glowing. That’s one of the reasons Jouer’s Luminizing Moisture Tint gives that little glow – it’s the Vitamin C. Retin A is an exfoliant and, literally, one of the only products on the market proven to fight fine lines and aging. Every woman, no matter her age, should add these two ingredients to her skincare. Oh, and sunscreen….prevention is very important! What is your everyday makeup look? I love natural, pretty makeup. I don’t follow radical trends (Just because Neon is in, or Pantone chooses a color of the year, doesn’t mean you should wear it on your eyelids). I even my skin tone with Jouer Luminizing Moisture Tint, dust a little bronzer on my forehead and across my cheeks and chin, I add a dab of cheek tint, curl my lashes, add mascara swipe on lip gloss and go. 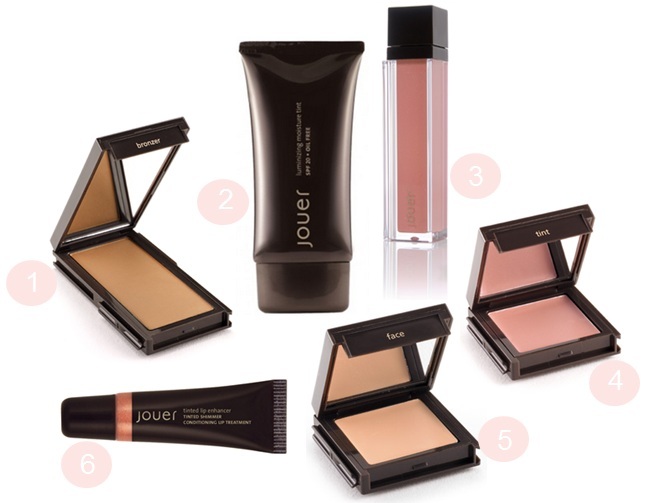 Quick, simple, pretty makeup is the philosophy of Jouer! I love the “slide and snap” Jouer packaging. What does your custom Jouer palette look like? My everyday, in my handbag, palette contains Jouer Perfect Tan Bronzer, Cameo Concealer, Bare Cheek Tint and Bare Rose Moisturizing Lip Gloss. Haha, exactly! The overall concept of customizing your palette came from my desire to carry a concealer in my palette. 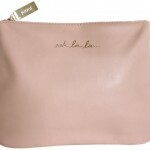 You can not find a makeup palette with a concealer in a beautiful formula matching your skin. The idea of the slide and snap packaging was born! 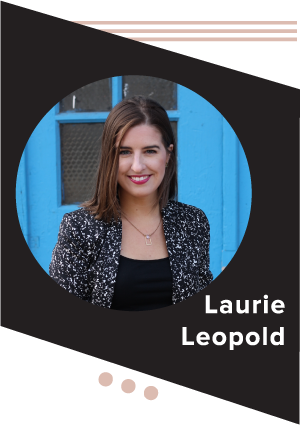 I want women to carry what they want in their palette, not what a product developer chooses! From there all my formulas hold a special spot, because I’ve painstakingly made sure they have great ingredients with skincare benefits. That said, I do not leave the house without wearing my Luminizing Moisture Tint! It’s truly a life-saver. Five products you never leave home without? When I’m running around town, I like to have my Cameo Concealer, Bare Tint, Bare Rose Lip Gloss (or Peach Pearl Lip Enhancer), Miel Lip Definer and now Baroque Crème Eyeshadow Crayon. When I need to get a little more “dressy” I swipe it on and I look like I’ve spent tons of time on my makeup. Shhh….secret tip, it takes 30 seconds! I can’t get enough of your “chic peeks” on Instagram. What can Jouer fans expect this year? I have always found it IMPOSSIBLE to find the perfect red lipstick. I’m red-lip shy. I’ve created a range of reds so everyone can find their perfect red lip. Plus, I’ve created a really fun graphic to help women figure out their red, and, it doesn’t involve your skin tones or whether your veins are blue or green. I can never figure those out! Holiday 2013 is OFF THE CHARTS fun. We had so much success with our Sparkle & Pop Holiday Crackers last year, we’re taking them to a new level this year. Chic Peeks coming soon! What’s inspiring you right now? Valentino’s Leather and Lace, my upcoming trip to DC to see the Cherry Blossoms, British dramas (Downton Abbey, Upstairs Downstairs, Call the Midwife) Gyrotonics, thoughts of Summer, my new tableware (Haviland Syracuse Rose – see @czjouer on Instagram), red lipstick, chunky jewelry, beauty and lifestyle bloggers, Homemade art, entertaining, Pinterest, happiness and gratitude. Lovely read! I’ve definitely wanted to explore Jouer more. I love their Age Repair Foundation, it’s wonderful for touch-ups and its literally invisible on! 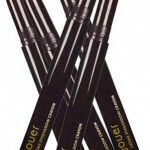 Taylor, that might be one of the only Jouer products I haven’t tried! I love how their makeup wears. Thanks for the recommendation — and for mine, I love the LMT (and MMMT!) and all of their Tinted Lip Enhancers. I wear Jouer bronzer every day as well. 312 Beauty © 2019 All Rights Reserved.